This will just contain weird stuff that I think up at random. 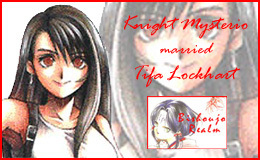 Ladies and gentlemen, I'd like to introduce you to my blushing bride, the lovely miss Tifa Lockhart. My dear sweet darling wife. Hey, I did say that this site was under heavy construction, didn't I?